Printer Showcase has been in business since 1987. We knew then that side by side printer evaluations were the only way to truly know which printers made the best value. More than twenty years later, it still rings true in today's virtual world where too much of the information is inaccurate or outdated. Don't be fooled by posers and pretenders claiming to be printer experts offering the promise of printer reviews without first hand printer knowledge. We find that most all of these web sites are mere shells that exist only to generate advertising revenue one click at a time. We actually have a live showroom full of the new printers we review and it's open to the public five days a week. Today our sales showroom is dominated by color laser printers. Visit our showroom virtually through our Color Laser Test-Drive and see your files printed on the printers you choose. 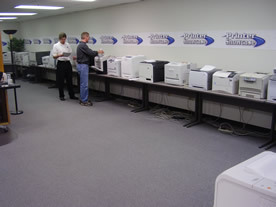 If you can't make it down to our showroom, you can still benefit from our first hand knowledge and years of experience in the computer printer industry. Our printer evaluations are performed by our team of trained service technicians, managers, and sales people to ensure that our reviews are as accurate as possible. Unbiased real-world information and expert recommendations are the primary reasons why our customers have been getting the right printer the first time for more than two decades. Our exclusive focus on printers allows us to offer a larger selection of the newest products from all the major manufacturers. Only after a printer has met and passed our stringent testing standards is it made available to our customers. Nothing is more important than maintaining our reputation as a leading source of top quality business products. Our unmatched customer service and support coupled with our deep price discounts provide our customers with real value. Printer Showcase.com is dedicated to providing accurate, clear, and timely information along with expert analysis on computer business printers. Businesses everywhere can use this information to help determine the right printer solution the first time. We want to help minimize wasted time and wasted printer dollars. The Printer Showcase.com e-store will provide our on-line customers with more than just a low price. Our customers enjoy access to the largest collective printer and supply inventory along with a 99% same-day order fill rate. We are dedicated to being reliable, accurate, and accountable. 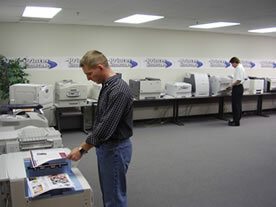 Printer Showcase sells only brand new printers and supplies from the original manufacturers. Our mission is to provide our customers with a dependable and knowledgeable source for all of their office printer needs.